Observation - Blackbird Turdus merula - Global. 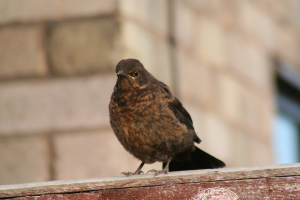 Description: Whilst a very common sighting in the sub urban garden the factor that was significant to the pair of Blackbirds nesting in my sub urban yard was the rearing of four seperate clutches this year. Whilst a very common sighting in the sub urban garden the factor that was significant to the pair of Blackbirds nesting in my sub urban yard was the rearing of four seperate clutches this year. No doubt 2009 weather conditions have been more favourable for the breeding season of many wildlife species. Several of these Blackbird chicks seemed to delight in branching (leaving the nest) far too early and I had to intervene with fledgelings from at least two of the clutches by placing them on higher ground after they had left the nest without any sign of deck (tail) feathers and were unable to attain any height when flapping their wings. With regular feline visits through the yard this 'minor intervention' was the only way to guarantee their ongoing survival.